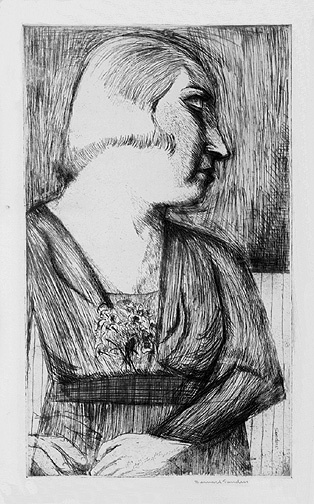 Untitled (Woman in Profile) -c.1930, Drypoint. Edition c. 20, Signed in pencil. Signed in the plate, lower right. Image size 14 7/8 x 8 3/4 inches (378 x 222 mm); sheet size 19 7/8 x 11 5/16 inches (256 x 294 mm). A fine impression, with full margins (1 1/16 to 2 13/16 inches), on cream Japan. Tack holes in the sheet edges, well away from the image, otherwise in excellent condition. 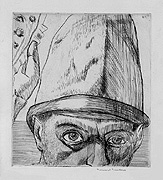 Untitled (Portrait of Man in Hat) -c.1930, Etching. Edition c. 20. Signed in pencil. Initialed in the plate, lower left. Image size 11 3/4 x 7 1/8 inches (299 x 181 mm); sheet size 16 5/16 x 11 5/16 inches (414 x 287 mm). A fine impression, with full margins (1 15/16 to 2 9/16 inches), on cream Japan. Tack holes in the shees, well away from the image, otherwise in excellent condition. Edition c.20. Signed in pencil. Initialed in the plate, upper left. mage size 8 7/8 x 5 5/16 inches (225 x 135 mm); sheet size 11 5/16 x 8 5/16 inches (287 x 211 mm). A fine impression, with full margins (1 1/8 to 1 5/8 inches), on cream Japan. Tack holes in the bottom a top sheet edges, well away from the image, otherwise in excellent condition. 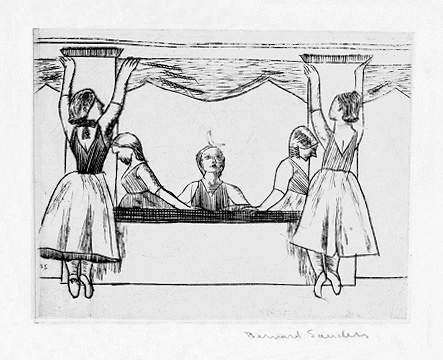 Untitled (Five Dancers) -c.1930, Drypoint. Edition c.20. Signed in pencil. Initialed in the plate, lower left. Image size 4 x 5 3/16 inches (102 x 132 mm); sheet size 11 1/4 x 12 7/8 inches (286 x 327 mm). A fine impression, with full margins (2 7/8 to 4 3/8 inches), on chine collé. Tack holes in the sheet edgewell away from the image, othersie in excellent condition. Ethel, No. 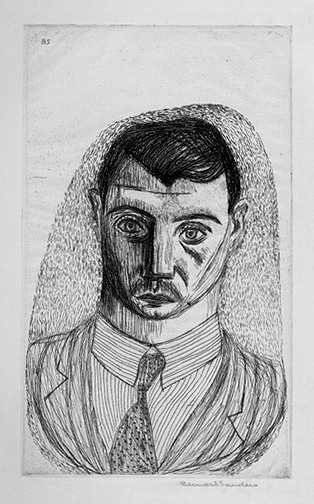 1 -1931, Drypoint. Image size 13 15/16 x 8 7/8 inches (354 x 225 mm); sheet size 19 1/4 x 11 7/16 inches (489 x 291 mm). 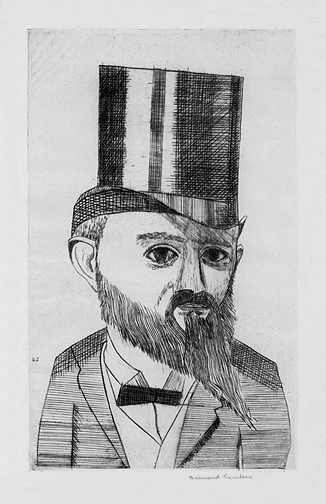 A fine impression, with full margins (1 1/8 to 3 1/16 inches), on ceram wove paper. Tack holes in the shedges, well away from the image, otherwise in excellent condition. Selected for Fifty Prints of the Year, 1931/32. 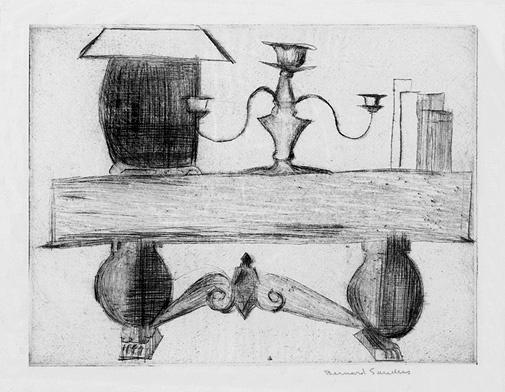 Still Life with Candelabra also titled Table -1932, Drypoint. Image size 6 3/4 x 8 7/8 inches (172 x 226 mm); sheet size 10 1/16 x 11 9/16 inches (256 x 294 mm). A fine impression, with full margins (1 1/16 to 1 7/8 inches), on cream Japan. Tack holes in the sheet edges, well away from the image, otherwise in excellent condition. 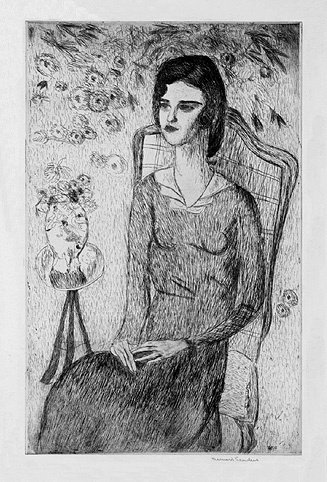 Girl with Lamp -1932, Drypoint. Image size 5 15/16 x 8 13/16 inches (151 x 224 mm); sheet size 9 13/16 x 11 3/8 inches (249 x 289 mm). A fine impression, with full margins (1 3/16 to 2 1/4 inches), on cream Japan. Tack holes in the sheet edges; brown paper tape remains in the top left and right sheet corners; all well away from the image; otherwise in excellent condition. 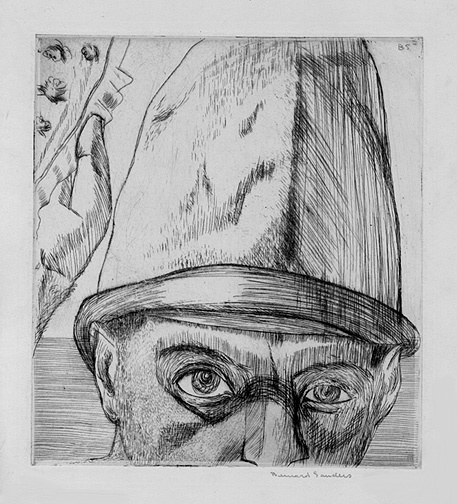 Man with Hat (Self-Portrait) - 1932, Drypoint. Edition c. 20. Signed in pencil. Initialed in the plate, upper right. Image size 9 3/8 x 8 7/16 inches (238 x 214 mm); sheet size 13 3/16 x 11 inches (335 x 279 mm). A fine impression, with full margins (1 3/16 to 2 7/16 inches), on cream wove paper. Tack holes in the sheet edges, well away from the image. otherwise in excellent condition. 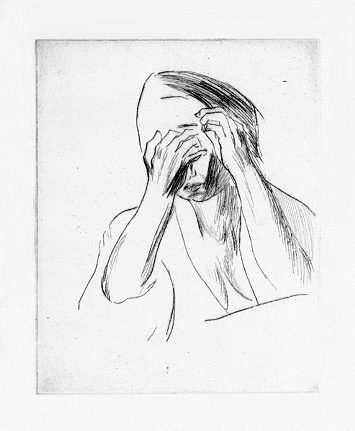 Untitled (Female Psychiatric Patient) -c.1934-41, Drypoint. Edition c. 20. Signed in pencil in the bottom right sheet edge. Image size 4 7/8 x 3 7/8 inches (124 x 98 mm); sheet size 9 7/8 x 7 15/16 inches (251 x 202 mm). A fine impression, with full margins (1 5/8 x 3 3/8 inches), on heavy cream wove paper. Tack holes in the sheet edges, well away from the image, otherwise in excellent condition.